Struggle to eat a 2 or 3 course meal at lunchtime plus coffee and mince pies? 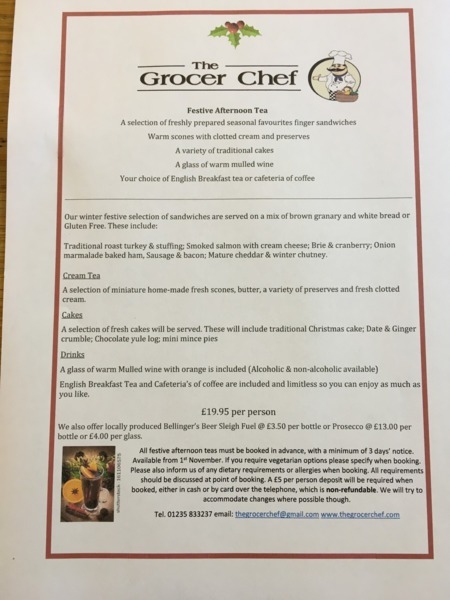 We have found that many customer's can't manage all of this when enjoying meals with friends during the festive season and hate wasting what they can't manage so this year we are offering a different type of Christmas lunch. Following the success of our Afternoon Tea's launched earlier this year and the love from our customers for the freshness and quality of our food we have decided to offer Festive Afternoon Tea's as an alternative to a traditional plateful of Christmas dinner. This allows people to take as long as they like to sit, in a warm relaxed environment, tastefully decorated and enjoy their lunch with as much unlimited tea and cafeteria coffee they like. We are also including a glass of mulled wine (alcoholic and non alcoholic) to enjoy alongside your lunch. Our sandwiches will be traditional and served on our lovely granary and farmhouse white bread. Our scones are baked for your arrival so they are warm for you to enjoy. Our cakes will be made by Maria and her Christmas cake and mince pies are a sell out every year. We will also have local brewery Bellinger's Beer very popular Sleigh Fuel ale available. So if you fancy a change you won't be disappointed by the quality of food or service you receive at this festive time of year. We are taking bookings from 1st November throughout November and December to allow you the opportunity to find a date that suits you. Bookings can be made between 11:30am - 2:30pm and you can book online by completing the form below and returning to us via email or ringing 01235 833237. Deposits can be taken over the phone by card or in person. A delicious selection of turkey & stuffing, brie & cranberry, smoked salmon and more fresh sandwiches. Warm selection of homemade scones, clotted cream & condiments. Mini mince pies, christmas cake, chocolate yule log and more cakes. Mulled wine and limitless tea and cafetiere coffee.